As the S&P 500 seems to have formed a double bottom in January and March, the question in many investors' minds must be "Have we seen the bottom?" My review of some of my market indicators indicate that it’s probably a little early to flash the all-clear signal for US equities. Mark Hulbert reports that insiders have been buying their own stock at levels that are comparable to other market bottoms. Insider signals tend to have a very long time horizon but their actions does have bullish implications. Investment bank valuations - more downside? Since much of the recent stresses that have shown up in the investment banks and brokers, I go back to my rule of thumb that I would like to see a price to book ratio of 1 for the investment banks. The P/B of 1x was a good signal of a market bottom in the 1974-5 and 1981-2 bear markets. While Lehman (LEH) did reach a P/B of 1x for one day at the time of the Bear Stearns panic, other investment banks and brokers such as Morgan Stanley (MS), Merrill Lynch (MER) and Raymond James (RJF), which is an interesting bellwether as it has no significant prop trading operations, are trading at valuations of 1.5 to 1.8 times book. Goldman Sachs (GS) is trading at valuations that are even higher than that. I could be wrong here but my guess is that there needs to be more pain in the brokerage stocks before the market bottoms. A check in with my group of smart funds shows that their posture remains defensive. The accompanying chart shows the market beta of the “smart funds” compared to the “consensus funds”. Smart funds have a market beta, or implied market exposure, that is lower than the market while consensus funds are at or positive market exposure. Moreover, the recent Barron’s Big Money Poll shows 50% of their respondents to be bullish or very bullish, compared to 13% as bearish. This is a contrarian bearish reading. This economic downturn was the result of overbuilt housing fueled by overly aggressive real estate lending. The chart below shows the S&P 500 Homebuilders relative to the S&P 500. The homebuilders remain in a relative downtrend and show no signs of stabilization, which is not a good sign for the health of the overall market. Addendum: When you get stories like KB Home's Broad Says Home Prices May Drop Another 20%, it doesn't exactly inspire confidence that housing has bottomed. Similarly, we have seen employment statistics starting to weaken, as is the case in any recession. Rather than looking at the payroll numbers, which are backward looking, I prefer to look at market discounting real-time statistics. My proxy is the price action of S&P Supercomposite Human Resources and Employment Services, consisting mainly of temp and employment agencies. The chart below of these stocks relative to the S&P 500 indicate that, like the Homebuilders, the Temp Agencies remain in a relative downtrend with no convincing signs of stabilization. How far or how long before a bottom? If my assessment is correct then the next question would be “how long or how far down before we see a bottom in the market?” William Hester at Hussman Funds, in his recent article Recessions and the Duration of Bad News, suggests that if this was an “average” recession we will likely see much more bad news in employment, housing, earnings, etc. If this was an “average” recession the chart he shows suggests that we are currently seeing a bear market rally but a more convincing market bottom is a few months off (see the last two charts in the article). Is this an average recession? I have no idea. All I can do is keeping watching my indicators for signs of a market bottom. First, some good news and bad news about China’s growth: From personal observation I have found the Chinese tend to be very entrepreneurial. This effect is demonstrated by the business dominance of the overseas Chinese in much of Southeast Asia, which has created friction in the past in countries such as Malaysia, Indonesia and the Philippines. This entrepreneurial spirit has created a nation of small businesses and an enormous dynamism which is fueling much the growth in China. However, Chinese business culture has not fully developed a professional manager class (with some limited exception in Hong Kong and Singapore). The business model of much of these small businesses consists of a single person at the top with managers and workers below, most of whom have little or no authority. Small businesses are not scalable into large businesses if there are no professional managers. Such a culture can create a nation of shopkeepers but not a nation of industrialists. This will create barriers to further growth at some point in the future. China has undergone over a generation of the one-child policy, which has served to restrict her population growth. The law of unintended consequences raised its head along the way. The population is aging rapidly. 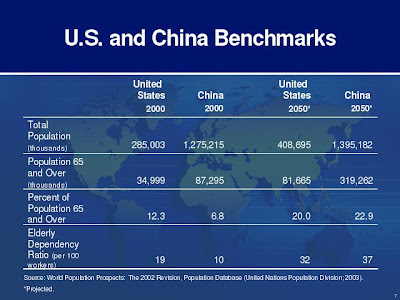 The accompanying chart shows that the UN projects the proportion of China’s elderly population, which is defined as those over age 65, will rise from 6.8% of the population in 2000 to an astounding 22.9% in 2050. China’s dependency ratio (ratio of non-working to working population) will rise from 10 per 100 workers in 2000 (19 for US in 2000) to 37 in 2050 (vs. 32 for US). The demographic bonus of a rising young, productive, working population will have been spent in the next 20-30 years. Beyond the mere numbers of age demographics, the cultural effects of the one-child male-preferred policy may further inhibit the growth dynamism of China’s economy. The family pyramid has become inverted, with parents and grandparents doting on the single child. This has created a nation of spoiled “little emperors” many of whom have grown up with a sense of entitlement and may not have the same work ethic as older generations. Many of these “little emperors” are now in their 20s. Can we really expect the same entrepreneurial drive from this age cohort as from older cohorts? Culturally, this will further inhibit China’s growth potential in the future. I began this post by referring to my seven year old daughter. It is with that time horizon in mind that I refer to China’s longer term challenges. In the meantime, China remains a powerhouse of economic growth for the next 5-10 years. Shorting it now would be like standing in front of a speeding freight train. A reader recently wrote and asked if the smart funds had reacted to the Fed’s rescue efforts of Bear Stearns et al. A check in with the analysis of Smart Funds show that they remain more underweight Financials than they ever have in the last four years, though they have somewhat moderated their underweight. By contrast, consensus mutual funds have moved to a slight overweight in the sector. This posture is suggestive that the Smart funds believe that there are more trouble ahead for banks. Barry Ritholtz at Big Picture recently posted on a RBC Capital Markets research report on 5 reasons why bank stocks have not bottomed. I would also add my comment that in extreme market conditions the brokers tend to trade at about book value. Today, most are trading at 1.6 to 1.7 times book. JPM and C moved to a price/book of 1 in the recent turmoil, but they are financial conglomerates and not pure brokers. "Fair value assumes the exchange of assets or liabilities in orderly transactions. Under SFAS 157, it is appropriate for you to consider actual market prices, or observable inputs, even when the market is less liquid than historical market volumes, unless those prices are the result of a forced liquidation or distress sale. Only when actual market prices, or relevant observable inputs, are not available is it appropriate for you to use unobservable inputs which reflect your assumptions of what market participants would use in pricing the asset or liability." …There are two problems with this rule. First, it clearly creates a lack of ransparency. The whole reason to require banks to mark their assets to market price rather than mark to model was to provide shareholders and other lenders transparency as to the real capital assets of a bank or company. Second, can a forced liquidation or distress sale be from a margin call? Obviousy [sic] the answer is yes. but as Barry Ritholtz points out, this opens the door for some rather blatant potential manipulation. If a bank makes a margin call to hedge funds or their clients to make the last price of a similar derivative on their own books look like a forced liquidation, do they then get to not have to value the paper at its market price? Is this not an incentive to make margin calls? One price for my customers and a different one for the shareholders? If a hedge fund was forced to sell assets and then they find out that the investment bank is valuing them differently on their books than the price at which they were forced to sell, there will be some very upset managers and investors. Cue the lawyers. In other words, this is going to be a mess. I did not wish to imply that it was the common use of the Barra or any other risk model that got equity quants into trouble in August 2007. What got quants into trouble in August 2007 was the mindset of the only active risk that should be taken is stock selection, or residual risk, and that we should control for industry risk and common factor risk such as size, style, etc. …it is common practice to measure risk using the assumptions of uncorrelated residuals, while using stock selection strategies that can only work if equation (1) does not hold (no factor bets). Since active mangers will be concentrating their portfolios in those securities expected to act alike in providing superior returns, the average residual covariance will be positive…Hence, if we use a risk model which assumes uncorrelated residuals we will have a downward biased estimate of the risks not identified by the factors of our risk model. One should also be particularly careful with multi-factor selection strategies where some but not all of the selection factors are in common with the risk model. In such cases, the risk model will tend to neutralize exposure to the risk factors, which will lead to the selection of a security set which are weak on the selection factors which are in common with the risk model, while having extremely high exposure to the selection factors which are presumed independent of the risk model. As such, it is easy for a multi-factor selection strategy to become dependent on a single component, defeating the purpose of the multifactor construct. - Value-driven methods are most compatible with quantitative risk management of benchmark-driven portfolios. - Growth-driven methods are far less compatible with strict quantitative risk limits and are more effective in relatively more concentrated, less risk-controlled portfolio construction applications where risk management is handled at the asset allocation level by diversifying across managers. As a counterpoint to my post Channeling my inner contrarian I thought that I would write about being a sheep and the advantages of following the crowd. A few years ago, I managed equity market neutral portfolios at a firm that was mainly known for commodity trading using trend following techniques, which are well described by Michael Covel in his book. During my tenure there I noticed that while the commodity positions were spread out among various futures contracts they often amounted to a few macro bets (i.e. on interest rates, on the US$, etc.) I came to the conclusion that these models were identifying macroeconomic trends that are persistent and exhibit serial correlation, which creates investment opportunities for patient long-term investors. For example, if the Fed is raising rates the odds are they will continue to raise rates until they signal a neutral or easing bias, i.e. there is a trend to interest rates, which is information that investors can use. The key risk in this class of models is knowing when to exit the trend, as short and long term reversals can be devastating to the bottom line. The accompanying chart shows the US Dollar Index in a multi-year downtrend (this is where technical analysis is useful as it spots long term trends). The currency is reflective of investor concerns of the current account and fiscal deficits going out as far as the eye can see and no meaningful policies to reverse them. The recent Fed actions of rescuing the system from collapse have led to some to question the Central Bank’s inflation fighting credentials, which have resulted in additional Dollar weakness. In the short term, however, the US Dollar is near the bottom of its channel and seems to be poised for a counter-trend rally. Inflation is everywhere and spreading. You just have to read stories like Stop the inflation in the US and Workers strike at Nike contract factory and demanding 20% raises in Vietnam, a low-wage country that had previously been a source of deflation. Commodity inflation is not just restricted to headline commodities like gold and oil, but is very broad based can be seen in foodstuffs (which begs the question of whether Core CPI = CPI ex-food and energy is a good indicator of inflation). The accompanying chart shows the Continuous Commodity Index (CCI), which is a continuation of the old equal-weighted CRB Index before its re-constitution to a liquidity-weighted index in 2005. The CCI has been advancing in the major non-US currencies as well as US Dollars, indicating that the commodity advance is 1) broad based and 2) independent of US Dollar weakness. Similarly, gold prices have also been showing a similar pattern to the other commodities. Gold appears to be regaining its former status as the alternative reserve currency. As I indicated before, the US Dollar is likely to rally in the short run and gold and other commodities would run into a headwind under such a scenario. Crude oil has a possible bullish dynamic of its own in addition to the rising trend in commodity prices: Peak Oil. Much has been written about peak oil by the likes of Matt Simmons, various contributors at the Oil Drum and by many others at APSO so I won't repeat them here. If the peak oil theory is correct and world oil production is indeed rolling over, then we are in for a period of very tough adjustments in not only energy usage but in the pattern of economic growth. Board structures at Chinese companies can lead to “confusion, ambiguity and potentially ... undermine the board of directors”, according to a study [by Risk Metrics] of the corporate governance risks faced by investors in China. Risk Metrics noted minority shareholders in the two jurisdictions [Mainland China and Hong Kong] do face some common risks. The state’s firm grip over China’s largest industrial and financial companies is mirrored in Hong Kong by the influence of tycoons and their families. The key risk to this trade is that the South Korean market is generally thought as as being highly sensitive to world growth and a significant slowdown in the US could affect it disproportionately.